Mesa County Commissioners sent a letter to the U.S. Environmental Protection Agency (EPA) and the U.S. Army Corps of Engineers (Army Corps) on the proposed revised definition of "Waters of the United States" (WOTUS). 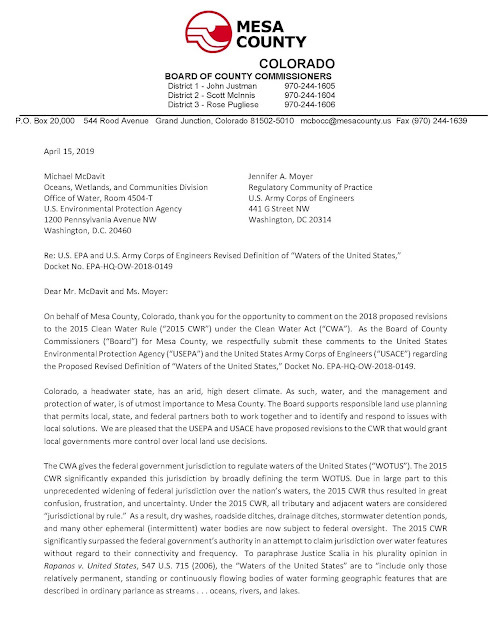 Earlier this year, the EPA and the Army Corps released the Trump Administration’s proposed new WOTUS rule defining which bodies of water are subject to federal regulations under the Clean Water Act (CWA), which is the second step in the process to review and replace the Obama Administration’s 2015 WOTUS rule. 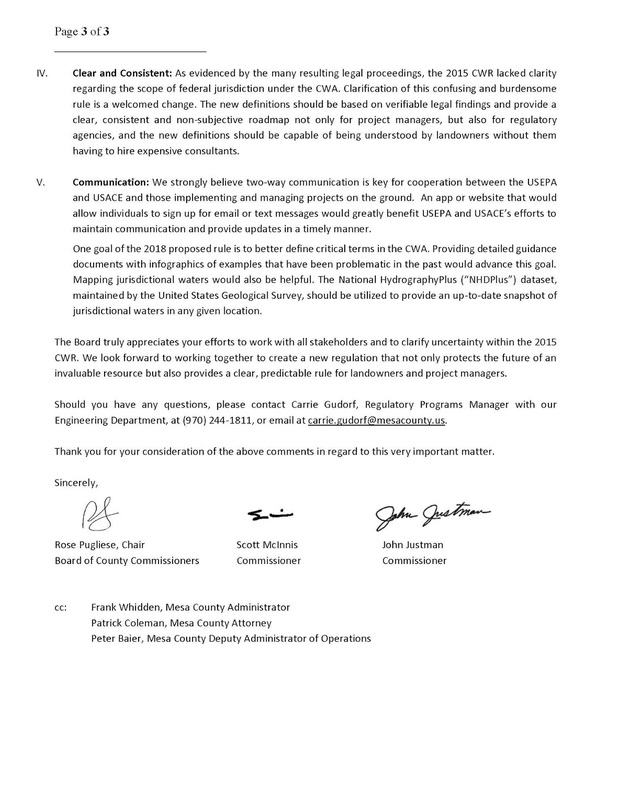 Mesa County Commissioners submitted comments and provided examples of how the proposed rule would impact county-owned infrastructure. 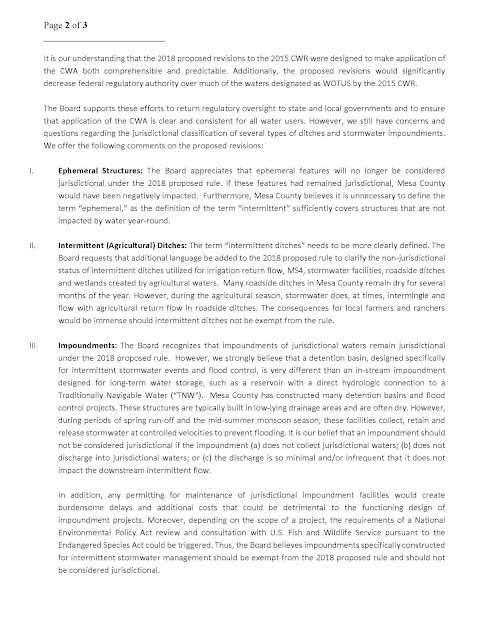 The Commissioners wrote: "Colorado, a headwater state, has an arid, high desert climate. As such, water, and the management and protection of water, is of utmost importance to Mesa County. The Board supports responsible land use planning that permits local, state, and federal partners both to work together and to identify and respond to issues with local solutions." 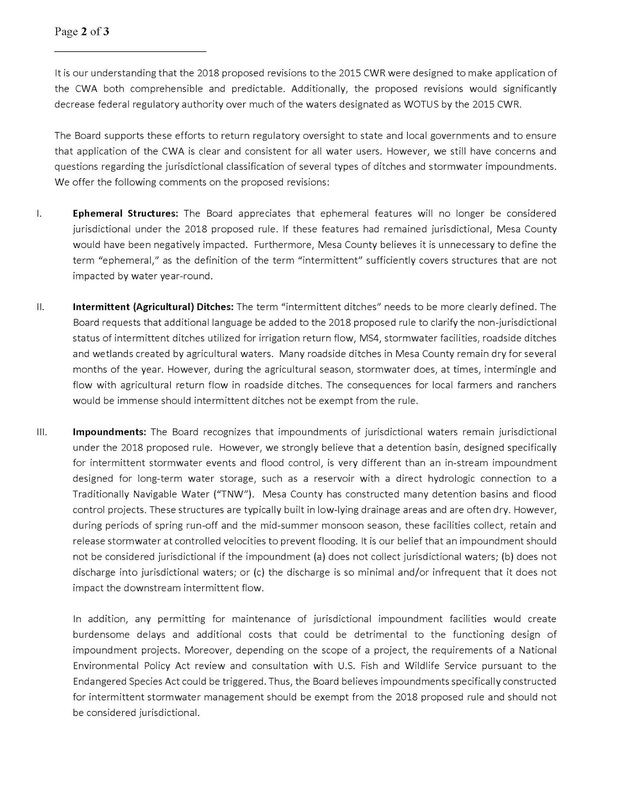 "We look forward to working together to create a new regulation that not only protects the future of an invaluable resource but also provides a clear, predictable rule for landowners and project managers," the Commissioners added. To read the full letter, go here, or view it below.